Chose the luggage that is preferred by the professional flyers, the Travelpro Crew 11 Hardside 22 Expandable Rollaboard! 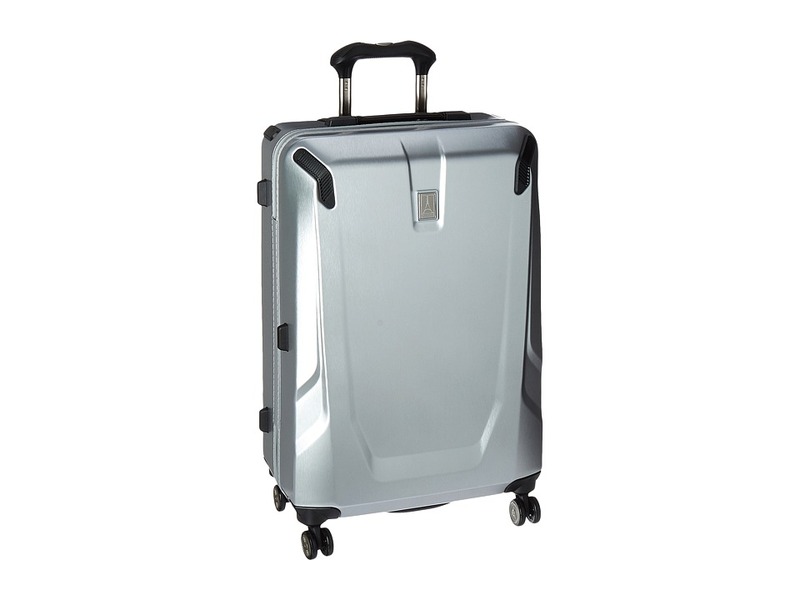 Go with the brand that the professional flyers choose, the Travelpro Crew 11 Hardside 22 Expandable Rollaboard. Textured polycarbonate resists scratches. Zip around closure. PowerScope aluminum handle stops at 38, 40 and 42.5. Contour grip provides a comfortable control. Top, side and bottom carry handles. Mounted TSA lock. Rear external USB port provides power for your must have devices on the go, power bank pocket connects to external USB Port. Built in cup holder. Lined interior features two packing compartments, wet pocket and three mesh pockets. Four 360&amp#176 rotating spinner wheels offer easy portability with a unique bottom tray that aligns and stabilizes wheels for effortless maneuverability and enhanced durability. Molded corner armor and built in skid guards. Imported. Measurements: Width: 14 in Depth: 9 in Height: 20 1 2 in Weight: 7 lbs 6.4 oz Proposition 65 WARNING: This product contains chemicals known to the State of California to cause cancer and birth defects or other reproductive harm. Chose the luggage that is preferred by the professional flyers, the Travelpro Crew 11 Hardside 22 Expandable Rollaboard! 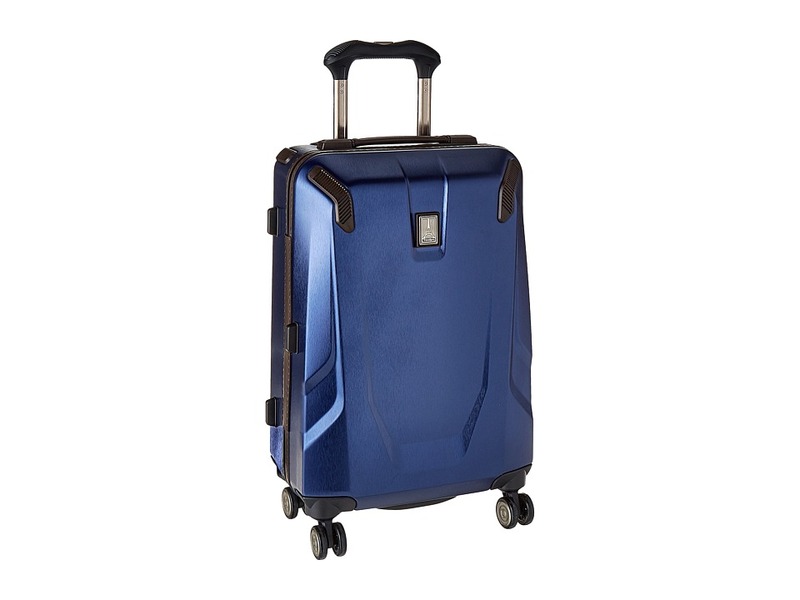 Go with the brand that the professional flyers choose, the Travelpro Crew 11 Hardside 22 Expandable Rollaboard. Textured polycarbonate resists scratches. Zip around closure. PowerScope aluminum handle stops at 38, 40 and 42.5. Contour grip provides a comfortable control. Top, side and bottom carry handles. Mounted TSA lock. Rear external USB port provides power for your must have devices on the go, power bank pocket connects to external USB Port. Built in cup holder. Lined interior features two packing compartments, wet pocket and three mesh pockets. Ball-bearing inline skate wheels for easy maneuverability. Molded corner armor and built in skid guards. Imported. 21.5 x 14 x 9. Proposition 65 WARNING: This product contains chemicals known to the State of California to cause cancer and birth defects or other reproductive harm. 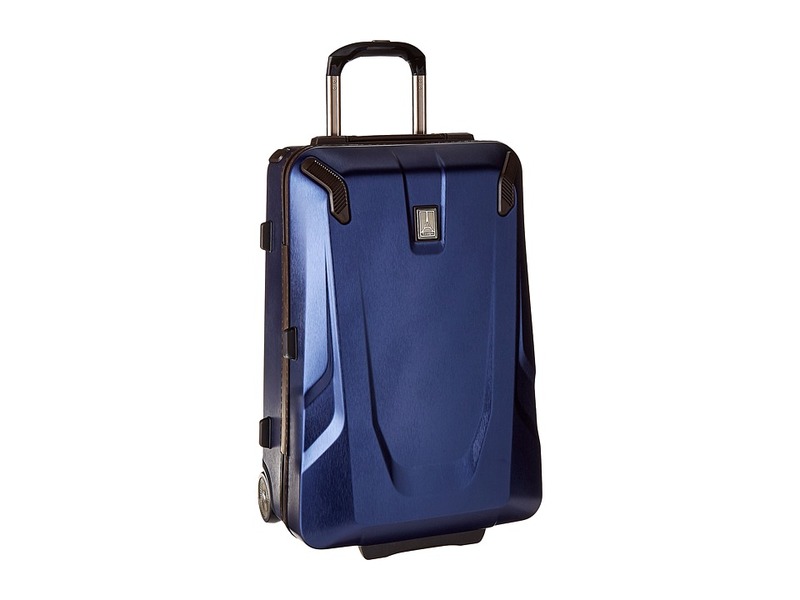 Chose luggage that is preferred by the professional flyers, the Travelpro Crew 11 Hardside 25 Expandable Spinner. Textured polycarbonate resists scratches. Zip around closure. PowerScope aluminum handle stops at 38, 40 and 42.5. Contour grip provides a comfortable control. Top, side and bottom carry handles. Mounted TSA lock. Lined interior features two packing compartments, wet pocket and three dry pockets pockets, and mesh shoe pockets. Four 360&amp#176 rotating spinner wheels offer easy portability with a unique bottom tray that aligns and stabilizes wheels for effortless maneuverability and enhanced durability. Molded corner armor and built in skid guards. Imported. Measurements: Width: 10 3 4 in Depth: 9 in Height: 25 in Weight: 8 lbs 14.4 oz Proposition 65 WARNING: This product contains chemicals known to the State of California to cause cancer and birth defects or other reproductive harm. Chose the luggage that is preferred by the professional flyers, the Travelpro Crew 11 Hardside 22 Expandable Rollaboard! 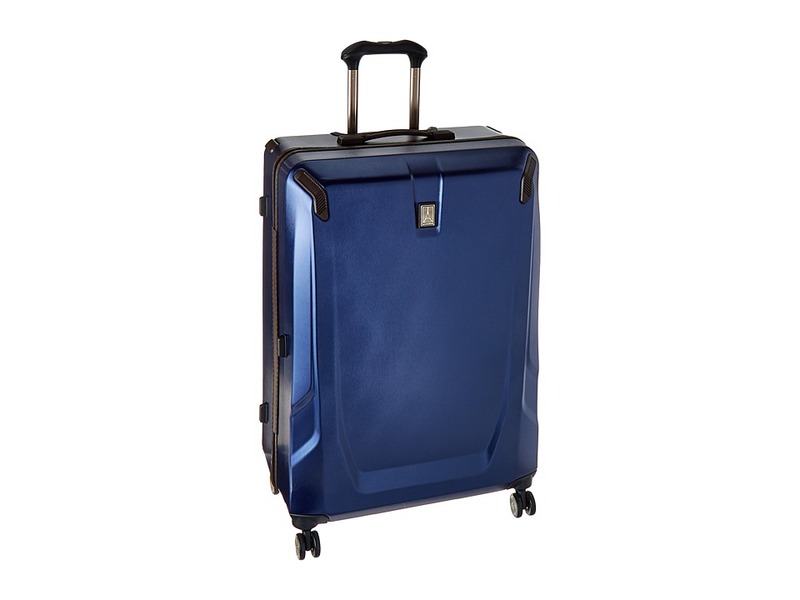 Go with the brand that the professional flyers choose, the Travelpro Crew 11 Hardside 22 Expandable Rollaboard. Textured polycarbonate resists scratches. Zip around closure. PowerScope aluminum handle stops at 38, 40 and 42.5. Contour grip provides a comfortable control. Top, side and bottom carry handles. Mounted TSA lock. Lined interior features two packing compartments, wet pocket and three dry pockets pockets, and mesh shoe pockets. Four 360&amp#176 rotating spinner wheels offer easy portability with a unique bottom tray that aligns and stabilizes wheels for effortless maneuverability and enhanced durability. Molded corner armor and built in skid guards. Imported. Measurements: Width: 21 1 4 in Depth: 12 3 4 in Height: 29 in Weight: 11 lbs 6.4 oz Proposition 65 WARNING: This product contains chemicals known to the State of California to cause cancer and birth defects or other reproductive harm.